September 23, 1972. I woke up to the hushed chatter of my extended family. My parents, aunt, grandparents, great uncle and great aunts were all glued to the television set watching something they described as "a fearful thing." 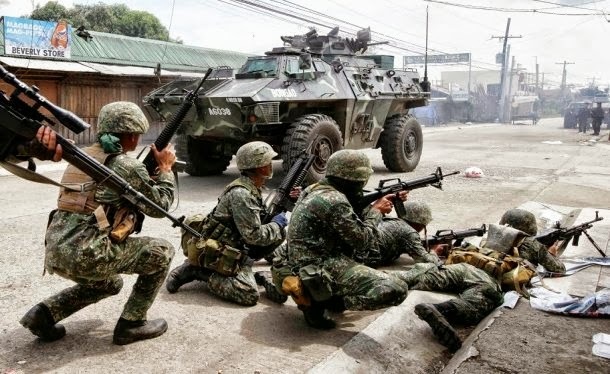 Martial Law has been declared over the Philippines. I got myself some breakfast and sat down in the living room with the rest of the family. President Marcos was on television saying something a 7 year old could not decipher. I wanted my cartoons. Finally I asked, "What's going on? What's Martial Law?" The entire family just wanted to shove a rag down my throat "Hush!" they said. "There might be somebody around that would hear us." I still did not understand. 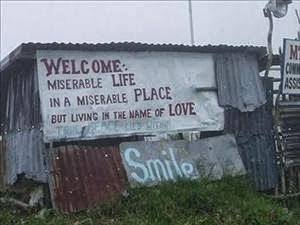 As the months went by, I learned little by little what was going on in my Philippines. There was an imposed curfew, which was not too much of an effect for the family because my Dad was a doctor and he always had special privileges. My great uncle was the a member of the Armed Forces. My aunt a state auditor for the police force. We always had soldiers or policemen at home. I guess that was for security. Too young to understand. December 1972 came around. Like all little kids in that era, I was over-excited for the coming New Year celebration. Fireworks! Being a little tomboy, I loved lighting those firecrackers! Here comes one more revelation. Firecrackers were banned. Violators will be imprisoned. 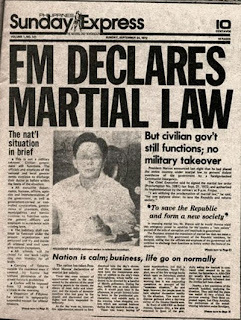 That was the first time I cried because of the strict regulations imposed by this Martial law. I got over it anyway. My parents said it was for peace and order. They said as long as we were not violating any rule, we were going to be okay. The only thing that made the family very upset was when my father had an emergency to attend to after midnight. Mom hated it so much. Two of my siblings earned the titles "Martial Law babies," being born in 1973 and 1977. It may have been because no one in my family were involved in politics, I saw Martial Law as the era of law and order. As always, we would go on Sunday-eat-outs, take a stroll in the park, and ride bikes around the neighborhood. I still remember being able to buy a tall glass of halo-halo (caramelized mixed fruits with shaved ice and milk) and fried bananas for 70 centavos. Pan de sal (fresh baked buns) was 25 centavos per piece. My parents said that the Philippines was doing good in the world economy. I did not understand. I had no knowledge of Gross National Product, foreign allies, or oil prices. I was a kid. All I knew was that some things changed, some stayed the same. January 17, 1981. Martial Law was lifted. At this time, I already had awareness of society, politics and the government. I was witness to the emerging lawlessness, the political turmoil, the dwindling economy. I wanted to understand what the clamor for "freedom" was all about. We were free, weren't we? We were not under any foreign rule. What kind of "freedom" did we need? Freedom from dictatorship? From the "Iron Rule?" People were asking for "Change." We eventually got the so called "Freedom" and "Change" that people were demanding from the government. Now that we are "free" there is still political and social unrest. The insurgents are still insurgents. The radicals are still radicals. Incompetent individuals have been elected into top positions in the Senate and the House of Representatives. There are more informal settlers than ever before. The issue in Mindanao has not been resolved. Political dynasties have emerged. The poor has become poorer. The purchasing power of the Peso has decreased so much that P100 pesos will not get you anywhere. 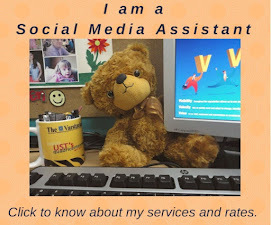 I am now part of the Filipino workforce struggling to make ends meet. One of the millions blindly resigned to having huge income tax deductions from their paycheck. Lately, that money was discovered to have been squandered by the greedy few. What can the ordinary Filipino do? Shake their heads in disbelief and sulk. Cheated again. Even if the perpetrators of this scam would be found to be guilty and eventually serve their time in jail, the P10 billion would never be recovered. Is this the change that we wanted? It is true that no single person can make the Philippines rise to glory. It must be the collaborative effort of each and every Filipino. Bring back the sense of Patriotism. Bring back the culture of "Bayanihan (Brotherhood)." Remind the youth that the lowly "walis tingting" (broom) signifies bonding and unity. Without the braided rattan ring, all strands of the "walis" will scatter and be useless. However, gathered and bound together with that ring, each strand will be one with the rest and function as one. Hence, the saying "united we stand, divided we fall"
I do not favor any political party. 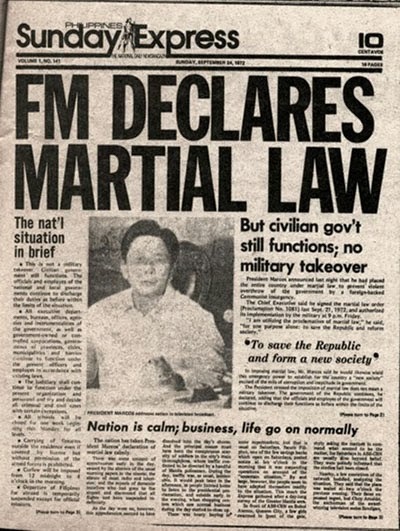 Martial Law is a thing of the past. We should have learned our lesson. NOW I UNDERSTAND. This is only my opinion. I am just an ordinary Filipino saying what I want to say - that this is how I experienced Martial Law and everything else that came after it. It's good to be enlightened about this. I don't know much of Filipin@ history because my parents never told me much but I grew up visiting a lot. My dad's side of the family is also in Quezon City! What an incredible story. I'm so glad you posted about this. My family is from Eastern Europe so I grew up with a whole other set of events but I love to hear what others went through. followed you back here Ms. Aio Kona. I'm impressed how you able to post this story. I have no interest in politics and for me it's enough info i heard from the mouths of our grandparents about marcos era. If I compared Marcos ways of running the country to the latest president in the country, i think I would prefer Marcos. he is smart to start this martial law and before that he did a lot of great things for the country. Ngayon ang politiko parang nlng naging katawa-tawa pati ba naman yung president na impeach, nakaktakbo for presidency uli at daming magnanakaw na politiko cge pa rin sa serbisyo. anyway, na off topic na tuloy ako. Thanks for sharing this story again sis, it's good to refresh our minds about Martial law. I don't know why, but I've always had an attraction to the Philippines. It started off in high school and I delved deep into your country's history and was fascinated by the conflict, the occupation of country after country... It's so interesting to read this from a first person perspective of a citizen! What a tumultuous time for you and the nation. Your story is riveting and an important part of history. TY!